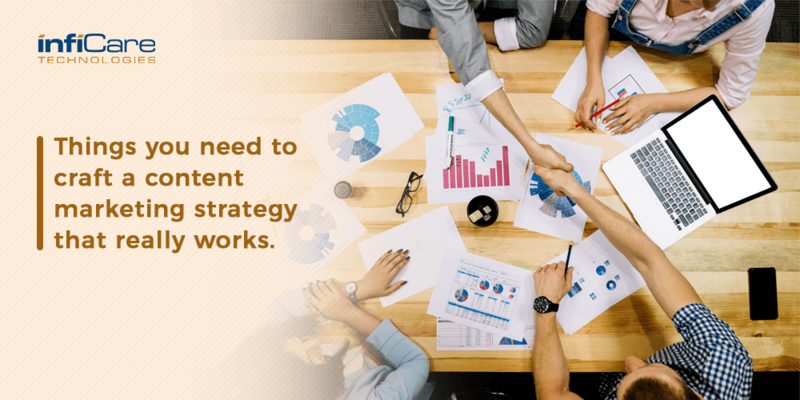 A strategic approach is necessary and crucial for successful content marketing. Crafting a content strategy can be worthwhile, because it makes everything afterward a whole lot easier: coming up with great ideas, measuring success, planning for your budget and team, and more. At infiCare, our content marketing team helped many clients devise their strategy that is unique. Our comprehensive content strategy covers every part of the marketing process. The entire content strategy depends on what a business wants to achieve. As we all know without setting up a goal, nothing falls in place, and same is the case with content marketing. How are we going to keep a track if the content will achieve our goals or not? What are the vital elements of content marketing? Once you have planned to walk along with a content strategy it is a must to follow a complete methodology to measure the success. As such having an insight on the success metrics is crucial. Our methodology includes the following metrics. Who and why are we trying to reach? Where are they located and how will we reach them? How much time is it going to take to leave an impact on their mind? What are they searching and need the most? How our solution can help benefit them? A good SEO result depends on a good keyword research. We start the keyword search and identify the most applicable terms, then make sure your content is tailored for those keywords. Search engines love content that’s considered highly relevant to an audience, meaning it receives high engagement rates. To deliver the high value you need to create quality and unique content.